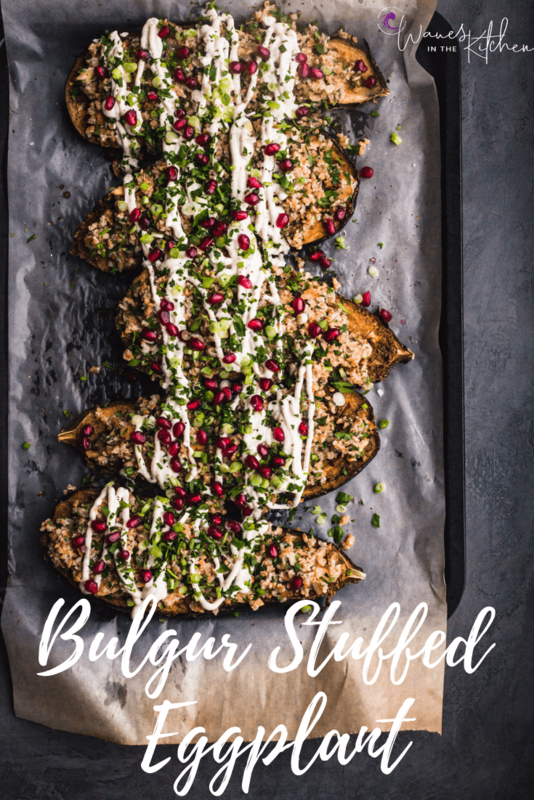 Middle Eastern spiced eggplant roasted until perfectly caramelized, mixed with a fresh herbed bulgur salad and topped with a bright and tangy tahini drizzle for a hearty, healthy, and deliciously vegetarian dish! This crowd-pleasing vegetarian dish works just as well as a side as it does as the entree for lunch or dinner! 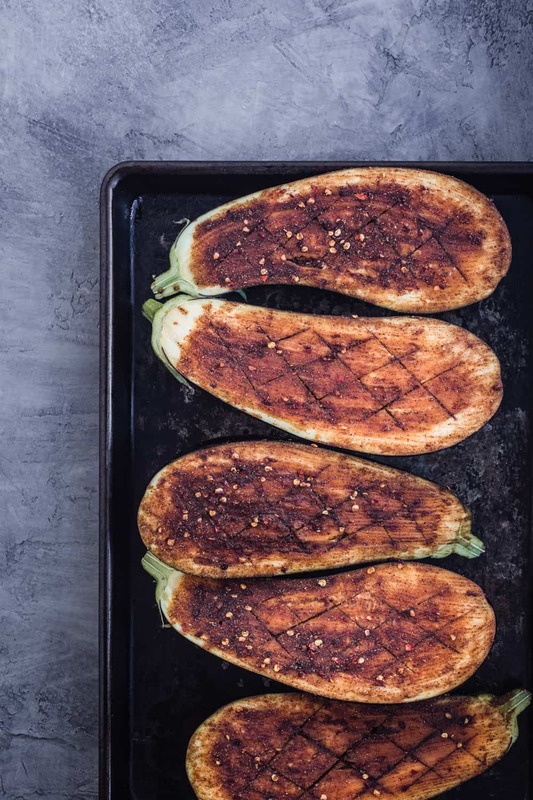 Roasting the eggplant on high heat until charred evaporates its moisture quickly delivering lusciously creamy eggplant flesh with the deepest flavor. Brushing the eggplants, which are natural sponges, with the spice mixture pre-oven ensures we’ll have a flavor packed dish. 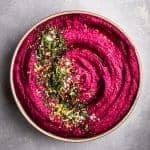 We take full advantage of the eggplant, scooping out and folding the flesh into the bulgur salad, and using the eggplant halves as bowls to hold the bulgur salad as well. Nutty bulgur wheat is fast-cooking and makes the dish super easy to put together. 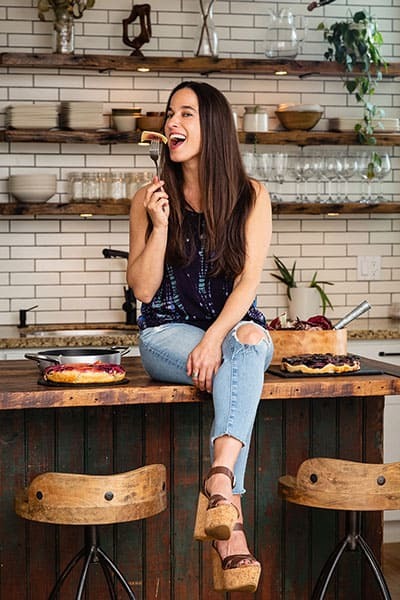 A splash of red wine vinegar and the tart barberries add a punch of brightness balancing out the dish. There’s a wide range of flavors and textures with the crunchy pine nuts, tart and chewy barberries, tangy tahini drizzle, bright lemon preserve paste, fresh scallions and topped with sweet n’ sour pomegranate seeds…YUM!!! 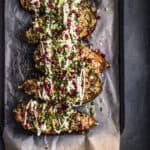 This eggplant dish is inspired by Yotam Ottolenghi’s famed Middle Eastern cookbook “Jerusalem.” In the book, eggplant is rubbed all over with a spice mixture, roasted, and then topped with a tabbouleh-like salad. I wanted to get a whole lot more bang for my eggplant buck and decided to scoop out the flavorful flesh and fold it back in the bulgur filling then returning it to the eggplant skin for another quick bake. And I’m so glad I did! The result is an increased eggplant-to-bulgur ratio in each and every bite. I changed up the bulgur salad, added tahini to the yogurt dressing, and the result is absolutely divine if I may say so myself. Halve and score eggplant, brush with spice mixture, bake, cook bulgur, scoop cooked eggplant out, fold into cooked bulgur and add the other ingredients to the bulgur salad, stuff eggplant halves with filling, pop dish back into the oven for another quick bake, make tahini drizzle, add toppings, drizzle to finalize the dish, and enjoy! Please enjoy some of my in process shots to help ya with your cooking. Eggplant cut jn half and scored, ready to be brushed. Eggplant brushed with spice mixture and ready to be baked. Eggplant bake and flesh ready to be scooped out. Don’t confuse bulgur with cracked wheat (which has a much longer cooking time). 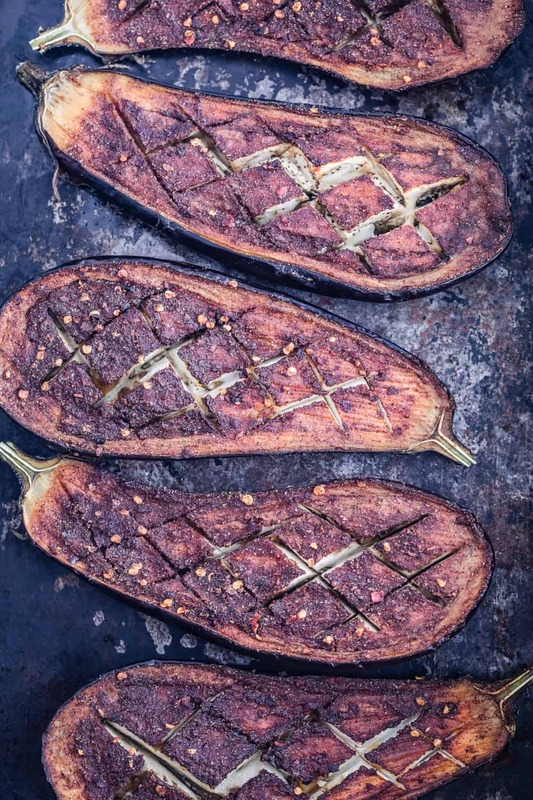 Score eggplant before baking to help set the flesh free. The yogurt-tahini dressing is *not* optional here. Quinoa or millet can be substituted for bulgur. Leftovers will last in the fridge for up to 3 days. 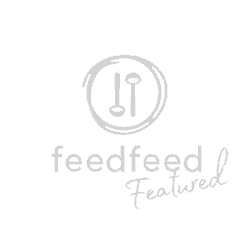 To make the spice mixture, in a small bowl, mix together the cumin, coriander, chili, paprika, preserved lemon paste, olive oil, and ½ teaspoon of salt. Set aside 2 tablespoons of the spice mixture. Cut the eggplants in half lengthwise. Score the flesh of each half with deep, diagonal crisscross cuts, making sure not to pierce the skin. Brush the spice mixture over each half, spreading it evenly and place the eggplant halves on a baking sheet, cut side up. 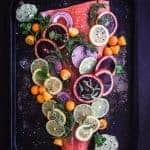 Put in the oven and roast until the flesh is completely soft, 40-50 minutes. While the eggplant bakes, bring water to boil. Stir in bulgur and let simmer for 12 minutes. Drain off any excess water and fluff with a fork. Soak the barberries in warm water for 10 minutes, drain and set aside. 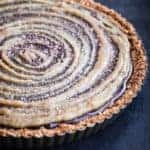 To make tahini yogurt drizzle, whisk together yogurt, garlic clove, tahini, fresh lemon juice, ground cumin, and kosher salt in a small bowl, adding ice water as needed to thin it out until you reach your desired consistency. Very gently scoop the eggplant flesh from the eggplants, being sure to leave about ¼-inch of flesh in the skins. Roughly chop the eggplant flesh. Heat the remaining spice mixture over medium heat and add the cooked bulgur, then fold in the chopped eggplant flesh, drained barberries, pine nuts, green onions, and fresh herbs. Off heat, add a splash of red wine vinegar, preserved lemon paste, crushed red pepper flakes and adjust salt and pepper to taste. Stuff the eggplant with the bulgur mixture. It’s okay if some of it falls alongside the eggplant. 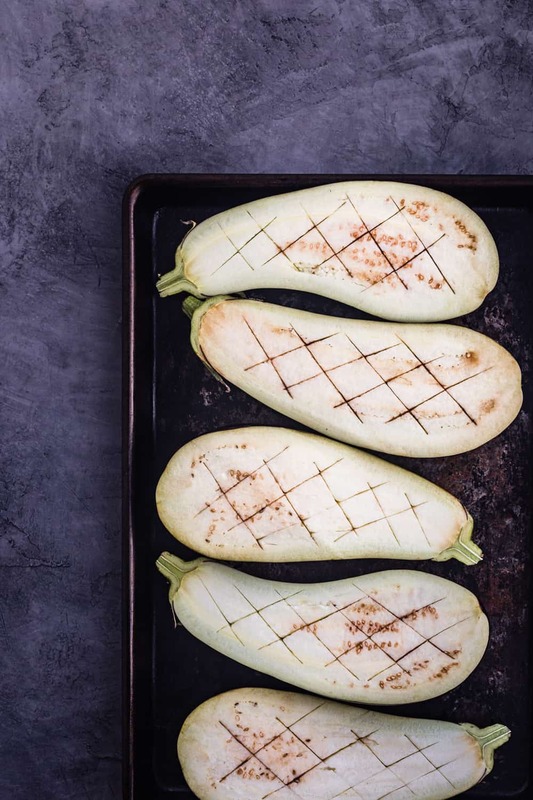 Return the eggplants to the oven and cook for 20 minutes. 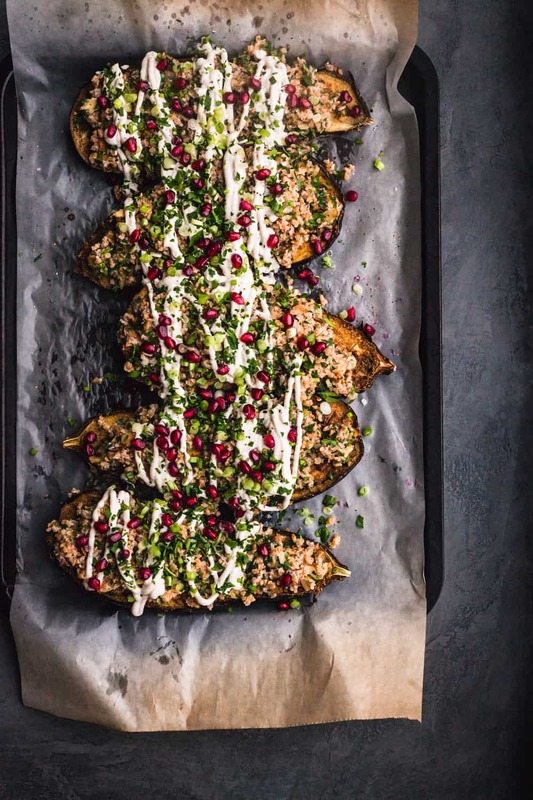 Transfer eggplants to a serving platter and top with parsley, green onions, lots of tahini yogurt dressing and pomegranate seeds (optional). Love eggplant, especially like this. Absolute pleasure Jacqueline!!! You are so sweet with all your feedback… I really appreciate it :). I just love eggplant and eat it any way ! Never tried this version of stuffed bulgur but seriously can’t wait to try. Gorgeous photos. Thanks so much! Am def a big time eggplant fan too! 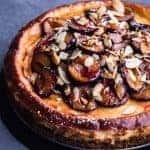 Do you have any favorite eggplant recipes? Thanks so much for the feedback and please do let me know how it goes after ya make it… would absolutely love to hear :). Absolute pleasure Fiona!!! Really appreciate the feedback :). Thank ya so very much and super stoked to hear ya enjoy the blog!